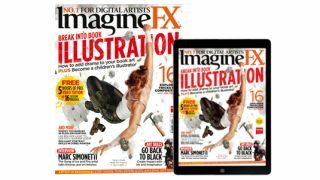 If you’ve ever dreamed of seeing your art on the shelves of your local book store, then this is the ImagineFX issue for you! Tommy Arnold’s striking cover art, with its strong sense of action and story, sets the scene for ImagineFx's book illustration issue. Inside, pro artists including Harry Potter illustrator Jonny Duddle reveal what it takes to illustrate children’s book – a tough sector to break into. Then the team explore the studios of Steve Sims, the illustrator behind the Beast Quest series of children’s books, and Tony DiTerlizzi, whose Spiderwick books continue to charm younger readers. In this issue, IFX also talks to Marc Simonetti, who came up with the definitive design for the Iron Throne from Game of Thrones, as well as illustrating Frank Herbert’s Dune series. Book illustrator Kiri Leonard’s sketchbook reveals a host of charming, child-friendly characters, and then you're into the workshop section. Here, you’ll learn about handling daylight, strengthening your composition, and creating a portrait in Corel Painter. Traditional media artists show how to make the most of a limited colour palette (Michael Manomivibul) and reveal how the cover of a Labyrinth comic was created (Cory Godbey). While Daren Bader reveals that location is key to his award-winning fantasy art. Luisa Preißler leads another great selection of art from our readers. Do you have what it takes to illustrate books for children? Enter the artistic lair of Steve Sims, illustrator of the popular Beast Quest books. Every month our pro artists solve your art problems. They can help! Marc Simonetti's art combines grand vistas with the human element. Sometimes it's good to start a painting without a plan, as Peter Polach shows. We review a bumper crop of books this issue, including Raphael Lacoste's crowdfunded collection. A minimal colour palette can produce maximum results, says Michael Manomivibul. Subscribe today and save up to 47 per cent (based on a quarterly subscription), and get our special print edition of Concept Artist, and 20 per cent off the Adobe CC Photography plan (print and print + digital subscribers only).